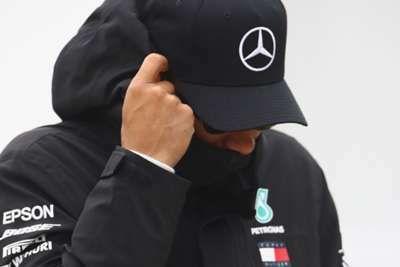 Lewis Hamilton has branded his Chinese Grand Prix weekend a "disaster", despite closing the gap on championship leader Sebastian Vettel to nine points. Hamilton cut a frustrated figure all weekend, complaining of a lack of pace in his Mercedes, and had to settle for fourth-place finish after starting from the same position. A late incident involving Max Verstappen and Vettel saw the Ferrari man drop to eighth and the Dutchman served with a 10-second penalty, but Hamilton took little consolation from his rival's misfortune in a race eventually won by Daniel Ricciardo. "It was another difficult day at the office," said Hamilton. "I was trying to hold on, but my tyres were done, so I had no chance of keeping the Red Bulls behind. "Saturday and Sunday felt like a disaster from my side. I just haven't had the pace since yesterday and I struggled with the car. "We've been underperforming but I'm not going to let my head drop because I know we have a tough battle ahead of us. I need to get back to my normal level of performance before I lose more valuable points. "It could have been worse, Max did me a favour today in terms of the points standings, but it's a weekend to forget, that's for sure. "Now we need to work hard to understand why we have been struggling and start the climb back to the front of the field." After seeing Hamilton finish fourth and Valtteri Bottas take second, team boss Toto Wolff added: "P2 and P4 is some good damage limitation from a tricky race but it is little comfort that this puts us in the lead of the constructors' championship as we head home. "We have seen the competitive picture change quickly over the past three races and it's clear that we still have much to understand about our car and how to get the best from the tyres. "We have been in tough spots before in recent years and shown the right spirit to respond. We will do the same again this time."